The Government Publishing Office (GPO) recently unveiled new libguides for researchers. FDLP LIBGUIDES currently features 16 different guides. Each guide contains government and some non-government resources relating to the topic. 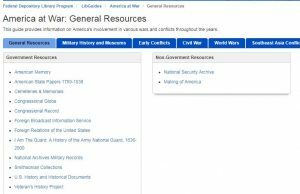 For example, the “America at War” libguide contains general information promoting federal resources that cover America’s military history. The guide is also grouped by periods (i.e. 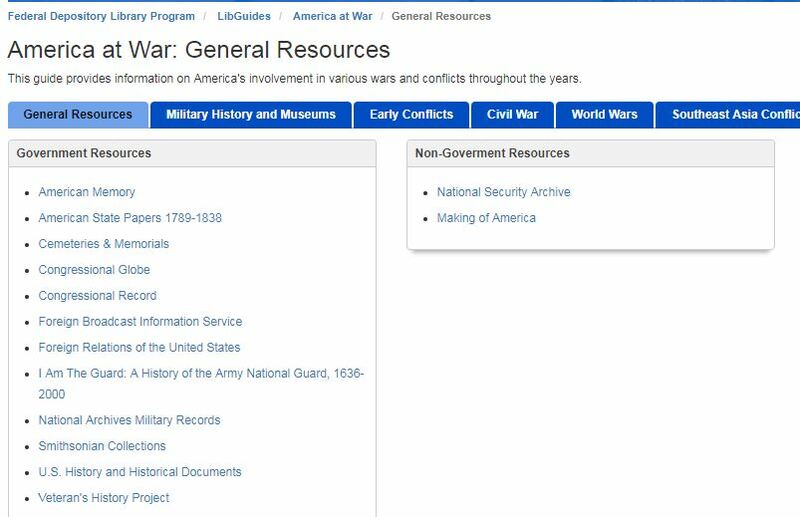 Early Conflicts, Civil War, World Wars, etc. ), and includes links to historical documents, papers, and maps. The libguides provided by GPO represent the latest in the agency’s efforts to meet the educational and outreach requests from the government documents community through the Federal Depository Library Program (FDLP). GPO also allows individuals to submit their own libguide, as well as request a libguide on a particular topic. The libguides can be accessed through the FDLP Academy, which also features free webinars on topics relating to federal government information. To learn more about upcoming webinars, visit the News & Events page.